If you are tying the knot this year and haven’t decided on the floral arrangements, you might be interested in the biggest wedding flower trends for 2018. We all know that bridal fashions are constantly changing, so what are the hottest trends for this year when it comes to wedding flowers? Floral chandeliers give brides a wonderful way to express their personalities without having to go too over the top on the bouquet. An opulent chandelier also provides a great photographic opportunity for the bride and groom to pose under. Say goodbye to rose gold, which dominated 2017 and hello to copper. Some might think this is an unusual choice for spring but thinking ahead to summer, copper adds warm tones and a feeling of luxury to bouquets. Gone are the ivory whites, and the creamy blush pinks of roses that traditionally make up a bride’s bouquet. This season’s bride wants the colours of the rainbow, and the brighter the better. 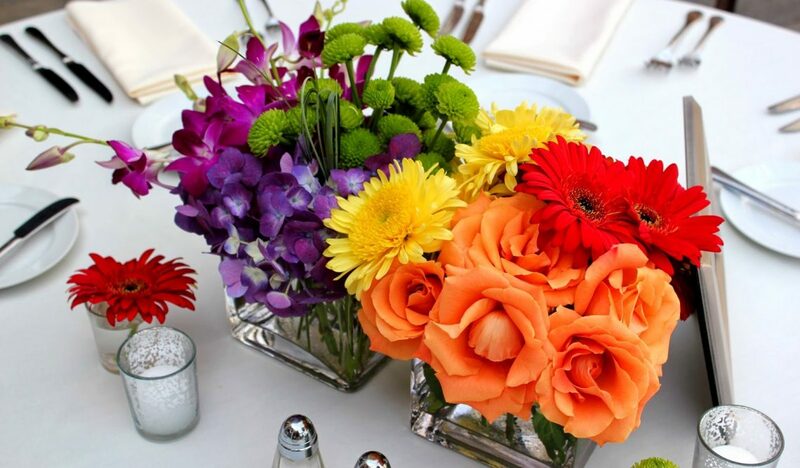 Think vibrant rainbow roses, brilliantly pink peonies, orange callas and match with blue butterflies and greenery. 2017 already saw living walls in some of society’s more opulent weddings, but they are now becoming more common. Living walls make a colourful impact and provide not only a great talking and focal point, but a super backdrop for wedding photos. This is another trend that started in 2017 but will become more popular in 2018. Floral hoops are carried low and are adorned with natural foliage such as ivy, moss, trailing greenery and natural blooms. Just be careful when you throw it to the guests! 2017 was all about the flower crown, where bride’s hair was adorned with fairy tale-like blooms. This year the onus has changed from the hair to jewellery. Instead of the bride wearing necklaces or bracelets, she will have flowers in place of them. So think cuffs and tiaras all made of flowers. Instead of using lush leaves for greenery, moss and heather will be substituted. Moss and heather add a real fairy-tale element to any wedding, without going too childish, and they also look great for a woodland themed wedding. Moss is a great option for couples who don’t want a lot of floral fussiness. Although this does slightly contradict our rainbow colours trend, there are some experts in wedding flowers trends that predict brides will be using one single colour. Using just one colour makes a stunning impact, especially if you go for different types of flowers and slightly differing shades. Talking of one colour, Pantone’s colour this year is Ultra Violet and this has already made a huge impact in the hair industry. It is also trickling down into weddings, and particularly flowers. There are tons of flowers that lend themselves to this colour, including orchids, stunning hydrangeas, and of course, roses. Finally, this is perfect for outdoors type brides who don’t want a lot of fuss about perfect flowers; foraged flowers really say something about their personalities. This wedding flower trend is definitely for cool brides who have their own style and it incorporates anything from long leaves, vines, and branches, literally, anything foraged.